When your inspiration knows no limits, you need a lens that can keep up—one that can shoot a beautiful sunset as easily as a nesting bird; the entire team as easily as a close-up of your favourite player. Meet the new 1 NIKKOR 10-100mm f/4.0-5.6 VR, a compact all-in-one zoom lens that delivers the benefits of a wide-angle and standard lens plus the high-powered zoom of a telephoto. Wherever your Nikon 1 adventures take you, the 1 NIKKOR 10-100mm f/4.0-5.6 VR will be ready to capture the views. The 1 NIKKOR 10-100mm f/4.0-5.6 VR packs enough zoom power to capture stunning close-ups of faraway subjects, opening exciting new shooting opportunities—birding, concerts, sporting events, graduations and so much more. 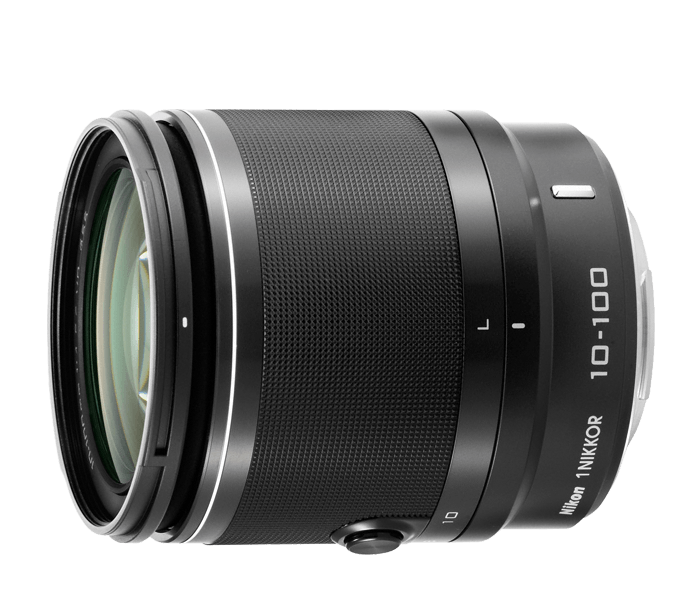 The 1 NIKKOR 10-100mm f/4.0-5.6 VR includes Nikon's Vibration Reduction (VR) image stabilization to keep your shots sharp; two Extra-low Dispersion (ED) glass elements for accurate colour; three Aspherical Lens Elements (AS) and three High Refractive Index (HRI) lens elements for superior contrast and colour, as well as its compact construction. Like all 1 NIKKOR lenses, the 1 NIKKOR 10-100mm f/4.0-5.6 VR is designed to be a compact, well-balanced match to your Nikon 1 camera. Fully collapsed, the lens is just 6.85cm—for telephoto zoom power in an extra small package! Comfortably bring your Nikon 1 and 1 NIKKOR 10-100mm f/4.0-5.6 VR wherever you go.